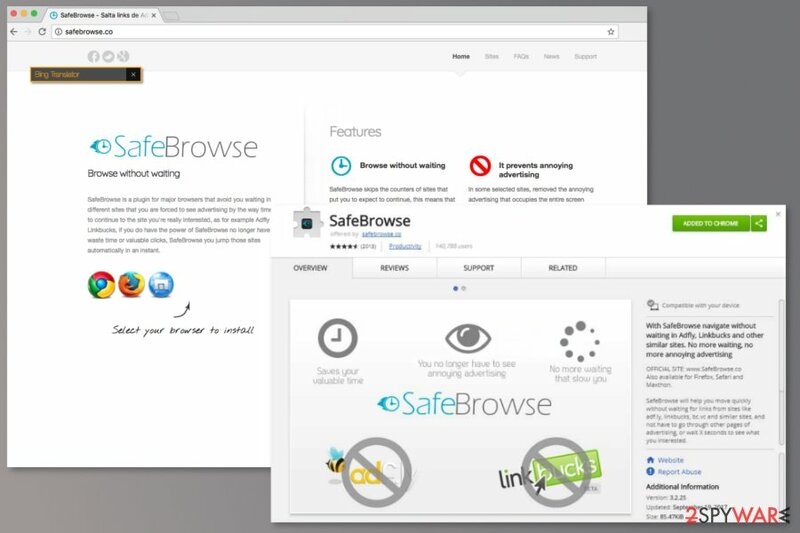 SafeBrowse is the PUP that uses misleading techniques to prevent removal. Use Reimage to locate malicious components and get rid of them faster than with uninstall instructions. A full system scan blocks virus reappearance and prevents traffic to malicious domains. 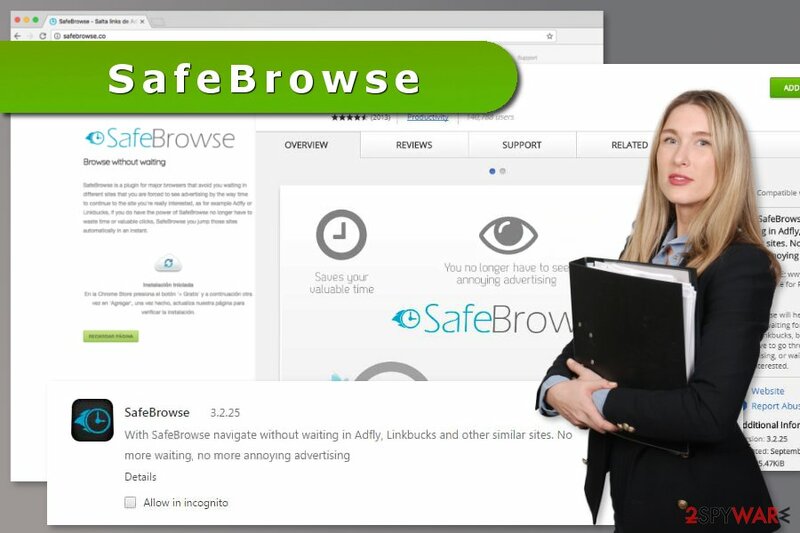 SafeBrowse is a browser extension that is supposed to speed up browsing sessions. According to its description, this add-on allows browsing without waiting for Adfly or Linkbucks. What is more, the extension is said to reduce the number of ads seeing on a browser. However, security experts do not agree that this tool is so brilliant. Once installed to Chrome, it installs a Monero Miner malware to the browser. According to the research data, infiltration of this malicious programs negatively impacts computer’s CPU and mine cryptocurrency while you keep the browser opened. The main sign of the SafeBrowse Google Chrome extension virus attack is unusually high Chrome’s usage of the CPU, which can be seen in the Windows Task Manager. This browser hijacker can use up to 50% of computer’s CPU. Such activity is extremely dangerous because when you browse the web (we assume that it’s a majority of the time when you keep your PC turned on), it works at a high heat for a long time. Thus, it might cause physical damage to the device. Nevertheless, SafeBrowse virus mostly aims Google Chrome; other web browsers, such as Firefox, Internet Explorer or Opera, might be affected as well. The official website of the extensions tells that this add-on is compatible with six popular web browsers. 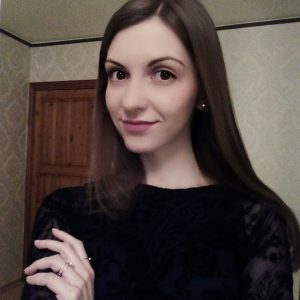 Therefore, if you have noticed that your computer became sluggish or freeze once in a while, you should open the Task Manager, and check for suspicious activities. If you see that Chrome (or another browser) use a high amount of CPU, you should open Chrome Task Manager and see what extension eats your computer’s resources. Most likely, it will be SafeBrowse. Undoubtedly, you have to remove SafeBrowse virus as soon as you find it on the system. If you have installed this add-on yourself, it’s time to uninstall it! If you are not sure how it came to your browser, we suggest using anti-malware and letting it fix your computer. However, if SafeBrowse removal with Reimage or another security software does not look like the right method for you, you should find our prepared manual removal guidelines handy. They are presented at the end of this article. SafeBrowse virus installs Monero Miner to Google Chrome to mine cryptocurrency while users browse the web. Browser extension was available on Chrome Play Store. However, once it was discovered that it could inject a malicious code for mining cryptocurrency, it was removed. Though, the add-on also has an official website. However, during our test, none of the download links were working. So, how does the virus spread? According to the researchers' team from Die Viren, such programs most of the time travel bundled with video players, PDF converters and other free software as an optional download. When users choose incorrect installation settings (“Standard” or “Recommended”), they might experience SafeBrowse hijack. you do not agree to change your default search engine. It goes without saying that you have to remove SafeBrowse extension from Chrome, Firefox or another web browser. However, it may not be enough, especially if you installed the add-on in a software bundle. You should also make sure that any other extensions or programs haven’t been installed without your knowledge as well. While you can perform manual SafeBrowse removal by following the instructions below, we highly recommend opting for the automatic option. Running system scan with professional software ensures that mining malware and other malicious components are removed entirely. Here, look for SafeBrowse or any other recently installed suspicious programs. Wait until you see Applications folder and look for SafeBrowse or any other suspicious programs on it. Now right click on every of such entries and select Move to Trash. When in the new window, check Delete personal settings and select Reset again to complete SafeBrowse removal. Once these steps are finished, SafeBrowse should be removed from your Microsoft Edge browser. Uninstall SafeBrowse extension, as well as other unknown add-ons, to stop malicious activities on Firefox. Here, select SafeBrowse and other questionable plugins. Click Remove to delete these entries. Now you will see Reset Firefox to its default state message with Reset Firefox button. Click this button for several times and complete SafeBrowse removal. Here, select SafeBrowse and other malicious plugins and select trash icon to delete these entries. Click Reset to confirm this action and complete SafeBrowse removal. Here, select Extensions and look for SafeBrowse or other suspicious entries. Click on the Uninstall button to get rid each of them. Here, look at the Homepage field. If it was altered by SafeBrowse, remove unwanted link and enter the one that you want to use for your searches. Remember to include the "http://" before typing in the address of the page. Now you will see a detailed dialog window filled with reset options. All of those options are usually checked, but you can specify which of them you want to reset. Click the Reset button to complete SafeBrowse removal process. ^ Joel Hruska. Browser-Based Mining Malware Found on Pirate Bay, Other Sites. ExtremeTech. The news and analysis of emerging science and technology trends. ^ Scott Orgera. How to Use the Google Chrome Task Manager. Lifewire. Tech How-To Guides & Tutorials. ^ Die Viren. Die Viren. German site about cyber infection and their removal. This entry was posted on 2017-09-26 at 07:14 and is filed under Stealing programs, Viruses. You can quickly scan the QR code with your mobile device and have SafeBrowse virus manual removal instructions right in your pocket. How did you remove SafeBrowse virus?